Every time I dip into Suicide Squad, the team changes up. The good news is that one of the new team members is Amanda Waller, the badass. Now, I’m sure she was made a team member some time ago, but seeing as how this is the first Suicide Squad book that I have read in the new series, it’s all new to me. So if you don’t know who Amanda Waller is, you’d do well to check her out. She was once the head of A.R.G.U.S., running the Suicide Squad. Now she’s a member and I like the leadership role that she’s taken in the group. Her dynamic with Deadshot is especially interesting when she witnesses him downing painkillers in the middle of a gun battle. The rest of the team tries to have their own moments, but they’re pretty flat and could have been sacrificed to further develop Waller and Deadshot. The art is pretty decent for a B-book, and I could see that with further practice, Briones’ art style becoming something special, but right now it’s decent, with only a few flat panels here and there. The whole time I was reading this book, I was thinking, “Man, I love Tony Daniel’s art,” but guess what? I was bambozzeled because it was Tyler Kirkman behind the artwork. So high marks for making me think it was Daniel’s artwork. Kirkman’s art style is very similar to Daniel’s except he does have a penchant for bulking up his male figures. The only negative that I can offer on the art is that sometimes the perspective is a little off. The last splash page for example has Black Manta wrestling Deathstroke underwater, Manta looks like a giant compared to Deathstroke and it looked a little odd. Now, don’t get me wrong, Tony Daniel is an amazing artist, but I’m not reviewing his art, I’m reviewing his writing. Sadly, it’s always been a little subpar for me. 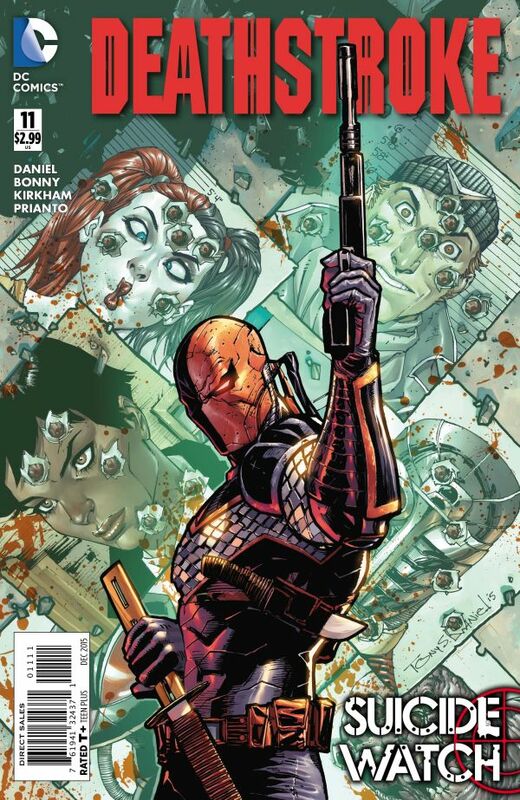 I’m just not buying that Deathstroke is the bad dude that we all know and fear. His narration seems off to me. It’s like he’s speaking as though Deathstroke is a young character and not the grizzled veteran assassin. Until Daniel gets the feel of the original version of Deathstroke back, I’m not going to enjoy this book as much as I could be. You know what? I could see myself reading this book full time. Howard the Duck is a B-character fighting B-villains. That’s his world and it’s an interesting take on the Marvel universe. Characters like “The Wizard” shouldn’t really rate in current comics. But those sort of characters fit in well in Howard the Duck’s world, and it makes sense for him to be victorious over their silly machinations. I think Howard voices the readers’ feelings when it comes to our world and the Marvel universe. He’s pissed at the world and the way it treats him because he’s perceived as an alien freak. He also voices the audiences’ feelings when it comes to the sillier of the Marvel characters. It does seem crazy to me that I can relate to an anthropomorphic duck on multiple levels, but here we are. One thing that surprised me about this book is how well Howard is drawn. He just has the perfect look in the book, and I would love to see a mature animated series using this art style. One thing that is kind of weird is that sometimes the human characters are drawn a little strangely and don’t quite fit with everything else that going on in the page. If you’re not convinced that you should look at this book full time, then I would recommend at least giving issue one a go. I’ll even say it’s my book of the week. 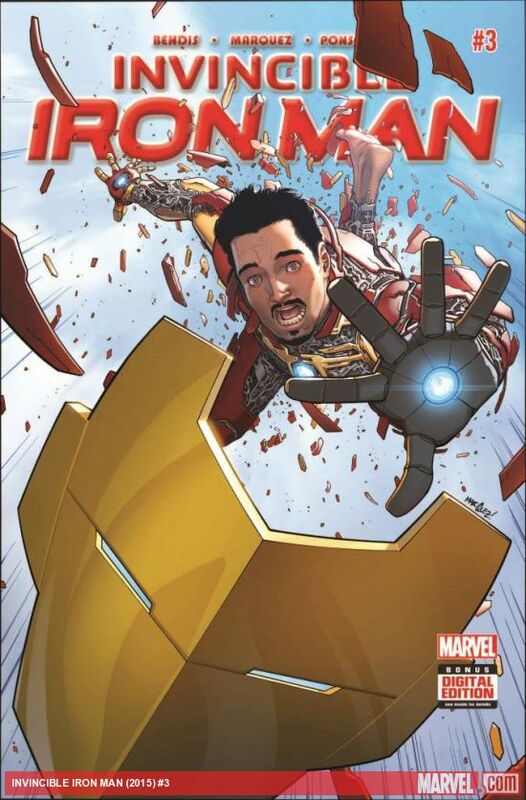 Sometimes when I’m reading a new series, I think, “This will become a classic run.” Ladies and gents, this new run of Iron-Man will become a classic. Issue 3 picks up where we left Tony, in the middle of a Battle with Madam Masque. It’s during this sequence that we see the Iron Man armour reconfigure in various ways throughout the battle. This is where Marquez shines. His drawing of the armour transitions is wonderful. Marquez will break the armour down into tiny pieces and the have them reform into a cannon, while part of the armour is still attached to Tony and has taken him to safety. He also nails the character expression and knows when to take it from realistic to cartoony. Also, Bendis. Bendis is a freakin’ genius. The comic is bookended with hard action and intrigue. It has real human emotion in the middle and the humour is there as well. There is a page and a bit of Tony standing in the background, Doctor Strange in the foreground. Tony is waiting for a high five. It may just be the funniest scene I have seen in comics and to describe it further would ruin the joke, so do yourself a favour and get this on your standing order. 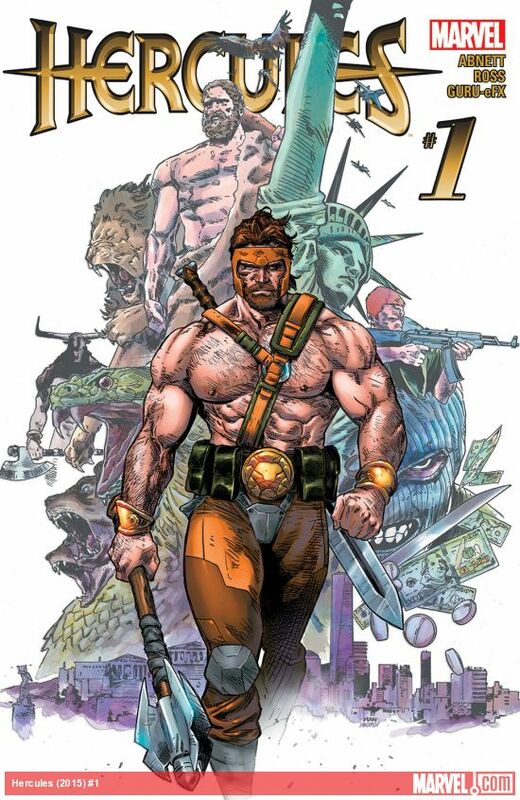 I find it pretty hard to understand how Hercules continues to get his own comic book. His comic isn’t bad, it’s just a bit middling and never quite manages to be anything interesting. When I looked at the book a couple of years ago, Herc was putting beings back into line who worked against humanity and its progress. Not much has really changed since my early days of reading Hercules comics. This issue really tries to push the idea that Hercules was always rumbustious and getting into the gossip columns, and I found myself wondering why I should care. This book is also kinda targeted at Greek audiences and if those audiences embrace the book, then it would make more sense as to why this comic is still being produced. The artwork is fine for what it is, but considering the vast mythology of the character, you would think that they would find an artist who could do a bit more justice to it. Hercules needs to be epic in scale to be interesting. At the moment, it just isn’t. Want to know where Marvel are putting all their big hitters? Simple answer is Star Wars. I’ve only had the opportunity to dip into Star Wars books every now and then, simply because there are just so many on the shelves. The book is written like a Star Wars film, it even moves from scene to scene, soundbite fashion like the films. 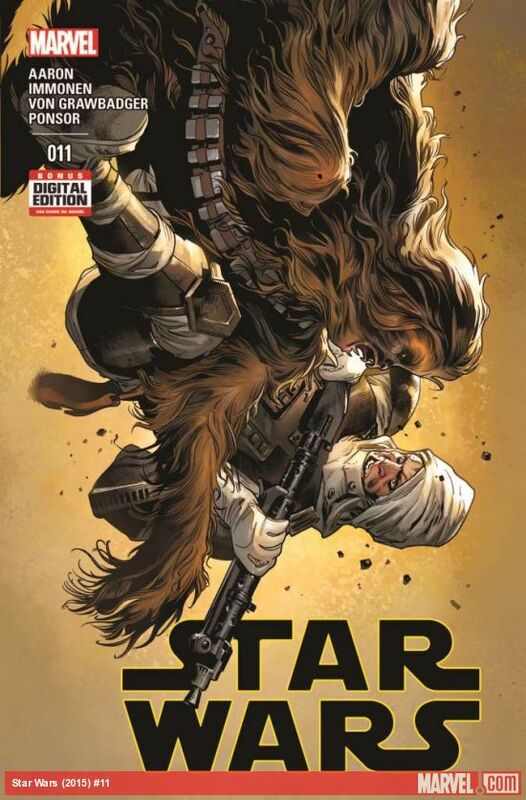 It’s also full of the Star Wars mythos that you’ll love and I think that Aaron has the characters down pat, so you will feel at home with his interpretation. Stuart Immonen pushes his art forward with a lot of background detail that other artists sometimes forget about. But when it comes to Star Wars, you have to get those details right. The Millennium Falcon’s consoles have to look authentic, and so does Luke’s lightsabre hilt. Immonen nails it and more with his vast backgrounds and true-to-character expression. This book will not be difficult for Star Wars fans to embrace. If you’re looking for a stylish steampunk series, then go now further. The artwork embraces the really pleasing aspects of the steampunk aesthetic. It also goes a step further and throws reptilian humanoids at you as well. Not sure if lizardmen are steampunk culture, but I like it. I thought the writing was pretty tight and had an Indiana Jones-adventure feel to it. The story is pretty simple, though, and if you want more than an adventure serial, you’ll probably have to look elsewhere. I have mixed feelings about the artwork, though. There is so much time and detail spent in the clockwork mechanisms or the flowers on her hat, yet, I felt that the character art could be disappointing sometimes and I wondered why the same amount of care hadn’t been put into the characters, but this only seemed to be a problem in the action sequences. This was my first Doctor Who comic and as a fan of the series, I had pretty high expectations. To be honest with you they were pretty much met. The advantage of taking Doctor Who to comics is that you can expand the set pieces normally seen on the show to an epic scale. In this issue, for example, London is burning as it’s occupied by creatures born from suns. London crumbles in the background and you see scores of people running for their lives. The action is more dynamic with vehicles exploding and monsters creating carnage. But it’s not all sunshine, because I felt that sometimes the action did take away from the spirit of the character. He’s more of a talker and will fight when required. But fighting is counter to the Doctor’s nature, so he doesn’t engage in the activity of war. You could see this issue as a glass-half-full or half-empty kind of thing. It depends on your perspective. One item that the TV series always nails is the creature design. The comic also achieves in this with designs from Daniel Indro. His Hyperions are made of fire and sun-like material. Indro draws them with a raging fire over muscles and it’s very striking, especially the fire angels at the end of the issue. I also think that Indro manage to get the TV likeness of the characters pretty down pat. Clara looks like her TV counterpart, as does the Doctor. Issue 13 is a good jumping in point, and may lead me to buying the other Doctor Who comics on the shelves. In the previous issue, our teenage gamer was given the game abilities in the real world and went on a bit of a crime spree that continues into this issue. Rain, our pop idol, is given her powers and is tasked with finding a powerful gamer who may destroy the real world. Kinda like a reverse Matrix scenario. Sadly, the script just isn’t up to scratch here. It’s loaded with exposition and when Davis tries to go deeper with Rain, it comes off to me as whiny and when our teen gamer crosses paths with Rain, his dialogue is cringe worthy. Axcend’s art is a cut above the rest and Davis does get the look of his series down pat. I would buy it each week just to see his different game avatar designs. The book does have a pin up girl quality to it without it being sleazy. I would also be doing a disservice to colourist Morrt Hollowell if I didn’t mention his contributions. Especially when it comes to the avatars and Rain’s holo-outfit on the cover and the start of the book. I think the art will be enough to get customers to buy further issues. It’s just a shame that the writing isn’t as good.